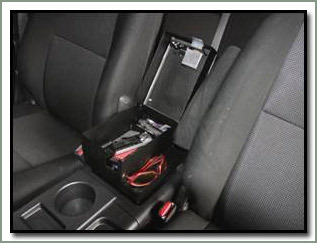 The Tuffy Security Console Insert for the FJ Cruiser adds a lockable storage and organizing compartment to the unsecured factory console. It provides a comfortable and durable armrest while keeping the original factory drink holder. The unique design allows the drivers side fold-down armrest to still be used. Each console features an internal storage tray to keep smaller items in as well as an external storage tray which is perfect for storing sunglasses and other loose items. Security is provided by Tuffy's patented Pry-Guard II Locking system which features a 10 tumbler double bitted lock and heavy-duty latch. Mounts using factory holes, no drilling required. Additional hardware is included for optional extra security mounting which requires drilling. Dimensions: Exterior: 6 ½ in. W x 10 in. L x 13 in. 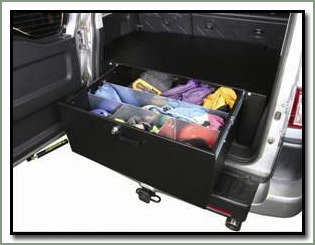 H. Interior Storage Compartment: 5 ¼ in. W (bottom) 5 ¾ in. W (top) x 7 ½ in. L (bottom) 10 1/8 in. L (top) x 10 ¾ in. H . Available in Black. Fits 2006 and later FJ Cruisers.